Sunset Bay is a beautiful 3 star complex situated in Torviscas, just a mile from the centre of Playa de las Americas and only 200 metres from the nearest beach at the Puerto Colon marina. The nearby promenade with its excellent selection of shops, bars and restaurants is within easy walking distance and the popular Aqua Park is also a short walk away. The complex benefits from a large freeform heated swimming pool with a circular shaped pool for children, a pool side bar serving drinks and snacks throughout the day and a children's play area. The pool area is being refurbished in June 2011. Attractive complex in a good location. Car hire is not necessary at this property. 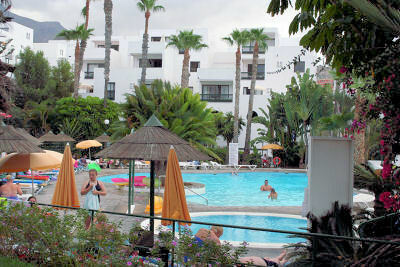 Wi-fi internet access is available in the apartments through the complex reception. Mention that you are staying in a private apartment and you will be offered a discount on the price.